You have never seen anything like the beauty of Central Idaho. Everywhere you look, you’ll find crystal-clear lakes, stunning greenery, and mountain ranges that line the sky. If you’d like to experience it for yourself, start with a spot like Alice Lake in Idaho. The scenery here will take your breath away! 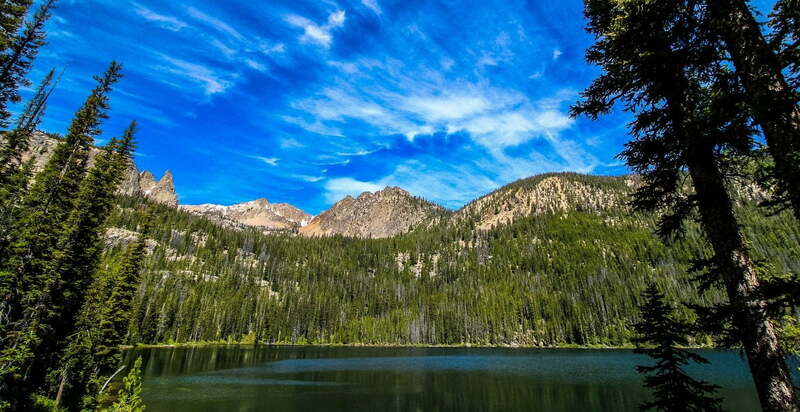 Are you interested in finding more spots to explore like Alice Lake in Idaho? Take a look at our free Vacation Guide! In it, you’ll find more outdoor activities, trusted businesses, annual events, and more. Cut your planning time in half when you access our handy guide! Hiking to Alice Lake in Idaho is one of our favorite experiences because it give you a true taste of the beauty of the Sawtooth Wilderness. You’ll pass by cascading waterfalls, cross over creeks, and experience the gorgeous mountain peaks on the 11.2-mile route. You can choose to follow part of the trail then turn around for a day hike, but it is best enjoyed as a backpacking trip. No matter what you decide to do, you won’t be disappointed! To get to Alice Lake, you’ll have to start by car. Travel south from Stanley along Highway 75 until you reach the sign for Pettit Lake. Turn right, then go down the dirt road for 2 miles as you follow the signs for the Tin Cup Trailhead until you reach it. Google Maps directions can be found here. Once you have reached the Tin Cup Trailhead, it’s time to embark on your hike! You will begin your journey along Pettit Lake. After about 1.2 miles, you will come to the wilderness boundary line; make sure you fill out the free permit here. Throughout the hike, you will gain 1,600 feet of elevation and cross 4 creeks. Although parts are challenging, reaching Alice Lake will be well worth it. The clear waters reflect the surrounding mountains, especially the towering peak of El Capitan. You’ll want to bring your camera for these views! Bring sandals for the creek crossings. There are 4 on your way to Alice Lake, so you won’t want to get your hiking boots wet! If you only want to hike the easy portion, we recommend turning around about half way. The second half of the hike is the most difficult; most of the 1,600-foot elevation gain is during this portion. If you get tired during your hike, make sure you take a break and drink water. The steep climb and creek crossings can be challenging! After your excursion to Alice Lake in Idaho, you’ll need a place to come back and relax. Rejuvenate after the hike at Redfish Lake Lodge or one of our other properties! 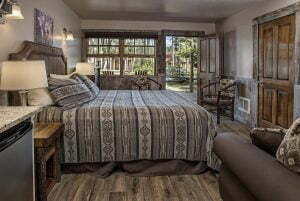 Our cozy accommodations at Redfish Lake Lodge, Triangle C Cabins, Redfish Riverside Inn, and Stanley High Country Inn have everything you need to get comfortable after your journey. No matter where you stay, continue to enjoy the beauty of Stanley when you take advantage of all our Redfish activities! We look forward to seeing you soon!